I wanted to take a moment to share a little of the concept and philosophy behind the Social: IRL conference series. From the day Social: IRL was launched, we adopted a philosophy of working with our clients, not simply for our clients. We believe in creating collaborative partnerships. Working with our clients to help them develop a true understanding of the social web and its impact on both their own operations and on their customers and community. To understand its impact on corporate culture and customer engagement. To identify opportunity and assess and protect against potential risks. And to empower our clients with quality training, relevant knowledge, a business goals first approach to developing strategy, and tools and techniques needed for successful execution. This is the exact same philosophy we extend to the Social: IRL conference series and I would hope anyone who has attended a Social: IRL event has experienced something pretty different from a “typical” conference. Something we don’t believe in is the standard conference keynote. 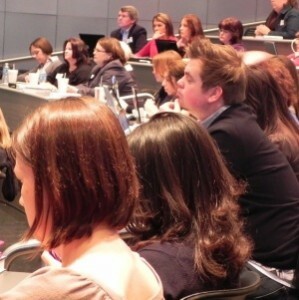 We don’t want attendees to simply come and listen, then leave inspired but not empowered. We work with respected industry experts such as Jeremiah Owyang, Brian Solis, Sarah Evans and Jason Falls. Those experts, our speakers for want of a better word, work with us to create events that go well beyond the typical keynote presentation and in to a very hands on learning experience. More of a boot camp format. An opportunity for each speaker to really impart knowledge in a much more in-depth fashion. Each event has a limited number of attendees to allow our speakers to really work with their audience, not just talk to them, and to allow for quality interaction and a high level of accessibility. And importantly to allow for a real day of progressive learning where attendees don’t just leave inspired but leave truly empowered with knowledge, understanding, tools and techniques. Community and networking is also an important focus for our events. We strive to connect attendees online prior to each event, provide quality networking during the event, and encourage continued dialogue and ongoing relationships after the event. Our goal is for the conference to be the start of an ongoing conversation between attendees and for our attendees to continue networking and learning well after the event has ended. It has been incredibly rewarding to see ongoing Twitter conversations between attendees, and to see some very real relationships that have been formed from connections made at our events. Finally, we also strive to make each event as affordable and accessible as possible. Obviously each event has a cost. That cost can be substantial. We are a business and need to cover costs and time and make a profit. But with each event that profit is very modest, especially considering the time commitment involved. We set registration fees to be just as affordable as we can make them. Those fees vary based on the expenses incurred in hosting each event. Typically the fees are substantially less than comparable events with the caliber of speaker we work with and hands on learning experience we strive to provide. We believe we are able to provide a great return on investment and really appreciate the number of attendees we see who attend multiple events to learn from different speakers. Non-profit organizations and full time students always have discounted registration opportunities for our events, and whenever possible we award no-charge registrations to at least a couple of students. That’s the basic concept. Taking top level industry experts, taking them beyond the typical keynote to create an in-depth learning experience, creating a community between attendees, and making each event as accessible and affordable as possible. I’d welcome feedback from anyone who has attended a Social: IRL event or questions from those interested in future events. And of course, thank you to the experts we work with who have embraced the more engaged format of event we create, and to all of you who have supported these events to date. The Springfield Area Chamber of Commerce worked with Ben Smith and Social:IRL for the recent Sarah Evans Boot Camp in Springfield, Missouri. It was a great event and I was excited to be able to offer the event to our Chamber members. Our members are craving social media knowledge and how their business or organization can best use it. Sarah was able to interact with attendees and address their questions. 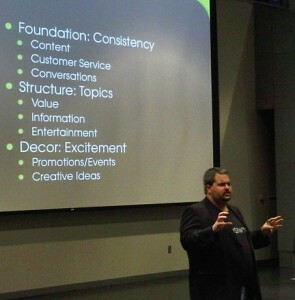 Social:IRL events bring in top industry talent at very reasonable cost per attendee.